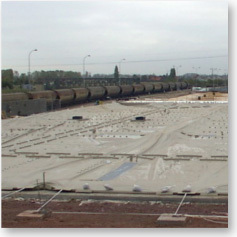 Installing FLOATEC® floating covers over sewage lagoons is an effective measure for eligible bioenergy projects to obtain Clean Development Mechanism (CDM) accreditation. Reduction of odour and volatile organic compounds. Reduction of organic matter content. Positive energy balance: net producer of renewable energy. Double contribution to the reduction of greenhouse gas emissions: By avoiding the release of biogas (high methane content) to the atmosphere, and by using this biogas instead of fossil fuels to generate energy. High tensile strength, tear and puncture. High impact resistance at low temperatures. Excellent resistance to cracking and environmental chemical agents. Outstanding resistance to UV, ozone and oxidation. Low water vapor permeability and absorption of water. High resistance to bacterial degradation.